Researchers at the University of Massachusetts have recently succeeded in reducing the population of an invasive species of winter moth through the introduction of a parasitic species of fly. The non-native winter moth, also known as Operophtera brumata, is known to severely damage shade trees and crops in New England. Entomologist Dr. Joseph Elkinton, a professor in the Department of Environmental Conservation, George Boettner, his lab manager and Hannah Broadley, his PhD student conducted the research for 14 years combined. Elkinton has evidence to suggest that the winter moth population has decreased in Massachusetts due to his release of the parasitic flies, known as Cyzenis albicans. The parasitic fly attacks winter moths and does not parasitize other native inchworms. “Blueberries have been severely affected by winter moths for the last 10 years,” said Sonia Schloemann, a member of UMass Extension’s Fruit Team that consults with fruit growers throughout Massachusetts. Winter moths are notorious among fruit growers in Massachusetts. The moths emerge in late November as adults and females lay eggs in the cracks and crevices of the host plants’ bark. The eggs eventually hatch between the end of March and early-mid April. The timing is important, since winter moth caterpillars will damage their host plants in the springtime, even before the host plant’s leaves fully open for the season. This can be devastating for blueberry crops, as fruits are destroyed before they are formed. Certain shade trees are also impacted by this insect. These caterpillars wriggle into newly-expanding host plant buds and then feed on the leaf or flower tissue within the buds. 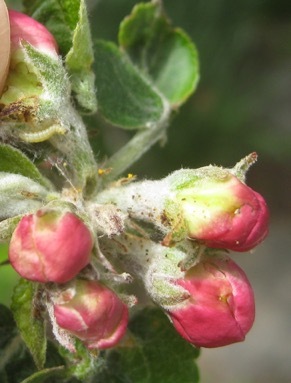 This means blueberry and apple growers must plan and implement management before these caterpillars get inside the buds. “The advantages of Cyzenis albicans, the parasitic fly that Dr. Elkinton is using as a biological control of the winter moth, is that biological control is a more permanent means of managing this pest insect,” Tawny Simisky, an entomology specialist with UMass extension, said. “The parasitic fly will hopefully reduce winter moth populations below damaging levels for many years to come. When compared to the reduced risk chemical management options such as spinosad [a type of insecticide] or Bacillus thuringiensis Kurstaki, it should be more cost-effective for land managers to have the biological control organism reducing winter moth populations across Massachusetts landscapes as opposed to making annual applications of insecticides. Elkinton is now working on two other insects attacking trees: the emerald ash borer, which is killing ash trees, and the hemlock woolly adelgid from Japan, which is killing hemlocks. “Those projects are major team efforts involving scientists from many states. In contrast, we were the only lab in the country running the winter moth biological control project,” he said.